"The McLeyvier's functions reportedly included notational score display, editing, and printout ('push a button and printed sheet music appears in publishable form'). A disk memory was capable of storing six hours of music material, and played it back via analog hardware with up to 128-voice polyphony. The computer was to accept commands 'in any language' including Braille. Priced between $15,000 and $30,000 depending on the options, the McLeyvier appeared at successive trade shows as the Interactive Music Processor and the Amadeus, before sinking without a trace. 'With the indomitable spirit of David facing Goliath,' in the words of the press release, Hazelcom proved itself not quite up to the job. "'It was a very special instrument,' she goes on. 'It was unbelievably reconfigurable, on the assumption that there is no best way to set up an instrument; it varies from person to person, and from piece to piece. Instead of coming up in any fixed way, the first thing it did when the program booted was to run an initialization program so that the user could customize it completely. As an integrated music environment, I don't think there's anything as good out there. You memorized a couple hundred commands, and you could use them at any point, so your world wasn't chopped up into a lot of separate editors. You had random access to everything all the time. Also, it was a musical language, an operating system for music composition. The vocabulary consisted of things like 'invert,' 'ostinato,' and 'transpose.' It had certain limitations,' she concludes, 'but it could do things that nothing else today can.'" 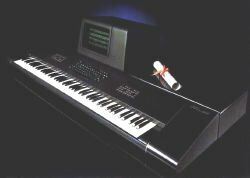 At the time of it's introduction, the McLeyvier was competing with several other CMS's [Computer Music Systems] in the marketplace, including the Fairlight and Synclavier. "However, there is a major difference between the MMS [McLey Music System, or the McLeyvier] and the other CMS's which makes it a most unique instrument. While the other CMS's use the computer to digitally generate sound waves, the MMS uses analog VCO's." "Although the MMS is definitely an analog synthesizer, it certainly does not look like one. In fact the only clue to its being a musical instrument at all is the keyboard itself. Gone are the knobs, switches, flashing lights and maze of patchchords that a synthesist used to create sounds. These functions of their equivalent (ie. filter parameters, ADSR, etc...) are still in existence, however it is through the computer that they are controlled. "Here is what the MMS looks like. It consists of four suitcase sized pieces. The first on is a velocity sensing keyboard. It is available in 88 or 60 note scale and comes standard with plastic keys; wooden/ivory ones are optional as is a thumbwheel. Its touch is a bit stiffer than most synthy-keyboards but is very smooth. "The next component is one you would associate with a computer. It is a typerwriter keyboard and a video screen called a CRT. The model supplied with the MMS is a DEC VT100 that has been modified. It is on the terminal screen that the player can see the status of the voices, sounds and other functions of the instrument. "The computer and synthy are housed in two other cabinets. Like most computers it doesn't look particularly interesting from the outside, but the MMS has several status lights to let you know whether it is functioning properly. These cabinets make up the main-frame. The computer is a DEC 11/23 processor. There is a disc drive, the memory [hard disk? ], 8-16 voice cards, an additional 256k RAM for the volitile or update memory, and a mixing card. "Since many of the computer components can be purchased ready-made form a manufacturer (in case of the DEC), it is in the custom designing of the voice cards that much time and effort has been spent. Each card is a mini-synthesizer in itself. There are 2 oscillators, 2 state variables (high, low, or band-pass, or notch) filters, a noise generators, external audio input, exponential/linear control amplifier, 2 ADSR's, stereo echo send, and stereo mix out. All of the parameters on these functions are controlled by a series of control amps. There are about 30 of them on each card and these points are given visual representation on the CRT in a block diagram. Using the diagram, the synthesist can see the state of any one of the voices in use, or creat new voices from a blank voice chart. Once created, the new or revised sound is named or identified to the computer and then it can be stored in memory." "The MMS is capable of mixing all the voices (up to 128) to a stereo output, with echo send as part of the program. Each channel can be set in volume and pan position. In recording situations this feature can save on the number of tracks needed and also on time-consuming bouncing of tracks. As well, there are individual inputs for external signals (which are inserted before the filters). With these inputs a multitrack tape recorder could be sent through the MMS and using each voice as a level control and EQ, an automated mix could be achieved. "There are several levels of clocks in operation in the system. Their functions are to provide a timebase for the events which occur while a piece is being written or performed. A metronome is built into the MMS and can be used as a click track. Or there is an input for an external metronome which can ge used to sync the synthesizer's internal clocks to an outside time source. "Because the computer is controlling the synthy directly, there is no voltage controllers that can be used as external control. However, this situation means that any MMS external device such as footswitches, bass pedalboards, swell pedals, fader boxes, can be used to control any part of the synthy program. Any of the above can be considered a keyboard." "Here are a few examples of the commands and their functions. If you want to change a pitch of a particular note in a memorized piece, type the FIX command. If you want a certain phrase to be repeated indefinitely, type the LOOP command. If you want to find out where you are in a certain piece and what voices you are using, type the INFO command, and you will see the information displayed on the CRT. "At this point the prospective list of clients includes: singers who could rehearse their parts using the MMS to simulate an orchestral background; arrangers who could test their parts on different instruments (eg. flute vs. oboe) and thereby use their ear more in arranging; film music composers who could use the MMSs metronome system to compose music that would be in perfect sync to picture; and educational institutions that could use the computer's ability as a learning tool to have it teach its own course."